DISCOUNTS FOR: Good Sam Club, AAA, CAA, AARP, WBCCI, BPA, Gulf Streamers, Airstream, Sworn Peace Officers, Fire/EMT, FMCA, USM/Active Duty, USPvIIL/Retired, US Reserve/ National Guard. Reservation policy: 5 night or longer reservations will be charged a $100.00 NON-REFUNDABLE deposit. A 48-hour notice is required to cancel a reservation of 4 nights or less, or a one night stay will be charged. **All sites are metered. Any electric use over $70 will be charged. ALL EXTENDED STAY RATES INCLUDE FULL HOOK-UP: 50, 30, and 20 AMP Electrical, Water, and Sewer. FREE Wireless Internet Access. FREE 70 Channel Extended Basic Digital Cable TV Service. FREE Courtesy Phone at office, FREE FAX Service. Weekly Lawn Care and Landscape Maintenance. 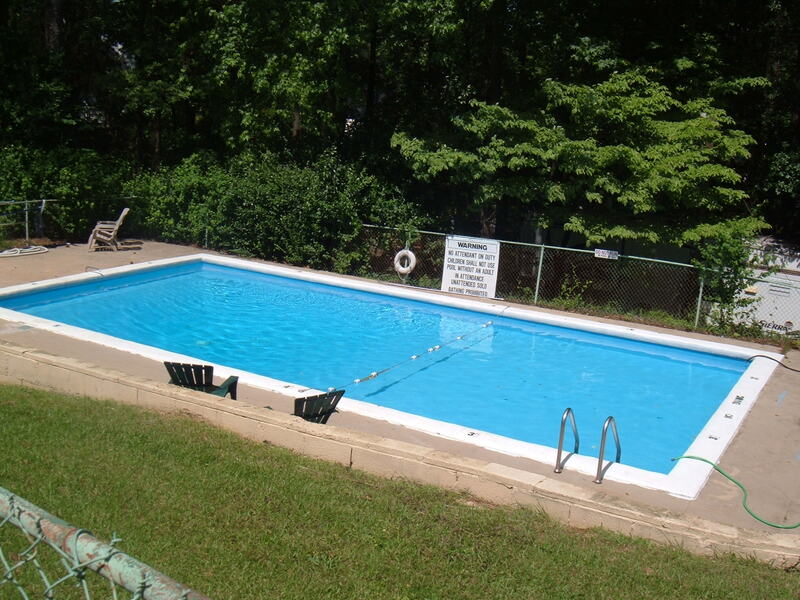 Monthly rate includes use of: Paved Level Site, Patio, Site Maintenance, Dumpster, Showers, and Swimming Pool in season. Keyed Postal Box, Coin Laundromat & LP Fuel Service. $100.00 Non-refundable deposit required when reservation is made in advance. All sites are first come-first serve. All sites are month-to-month with no lease available. Rates are for up to six persons and up to two vehicles. Check in on arrival date after 1:00 p.m.
We accept US Currency, MC, Visa, Discover & AMEX Credit Cards and Travelers Checks. PHOTO ID REQUIRED WITH PAYMENT. All units, including pop-ups, must be self- contained, with electric service, water and sewer (sink, shower & toilet). NO TENTS. NO DRY CAMPING. All guests are subject to all posted rules and regulations. All Sites are taxed an 8% Cobb County Excise Tax for the first 10 days of occupancy. This tax will show on your receipt, but your monthly amount will not change. Ask Park Manager for additional rules and conditions that may apply without notice. If you would like to make an online reservation, please fill in the following form and hit the submit button below. You will receive a confirmation email or a phone call from one of our staff members to confirm you reservations within 24 - 48 hours.